The infra-red image above highlights a large scorch mark on the outside rim of trough WK 285. The scorch mark suggests that the object was, at one time, used in the vicinity of an open fire. Vessels of this type, including the two additional troughs included in this research may have been used for hot stone cooking. In this technique stones heated in a nearby fire are added to a liquid within the vessel. The stones are continually retrieved, reheated, and returned to the liquid until it reaches the desired temperature. The eyelash-like feature at the centre of this image is known as a sclariform perforation plate. These features are found in only four native Irish tree species- Alder, Birch, Hazel, and Holly. The number of individual 'bars' on each sclariform perforation plate is diagnostic of tree species. The number visible here indicates Birch or Alder. The distribution of vessel (or pores) is visible in this transverse section. The pores are densely packed (with wide variability), in radial multiples and groups, indicative of Alder wood. While this object is identified as being made from Alder in the museum notes, the method of identification is unclear. A small sample of wood was collected from trough WK 285 to confirm the museums previous identification. 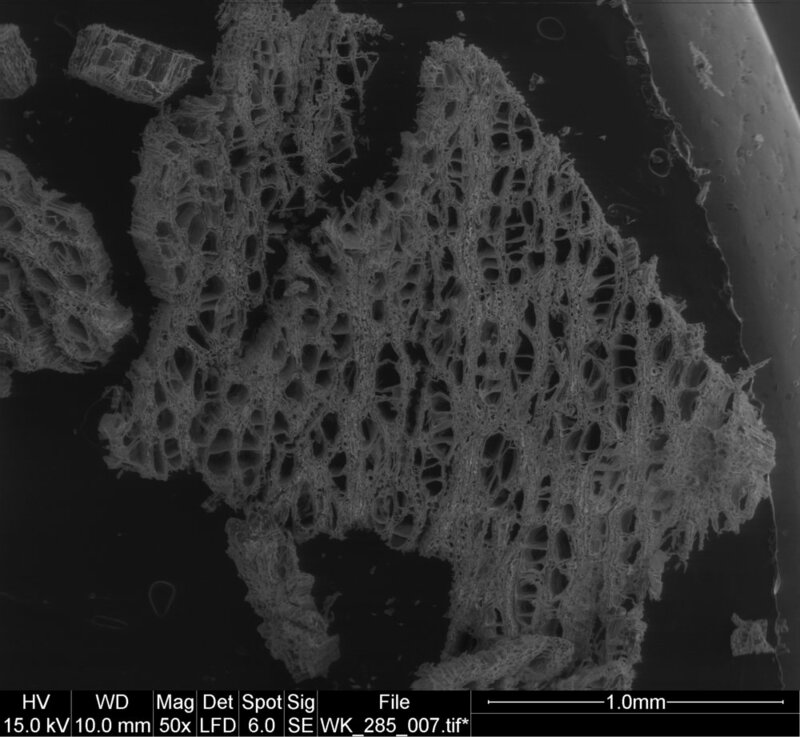 A sub-sample was cut into thin slices known as 'sections', and mounted for examination using a scanning electron microscope (SEM). 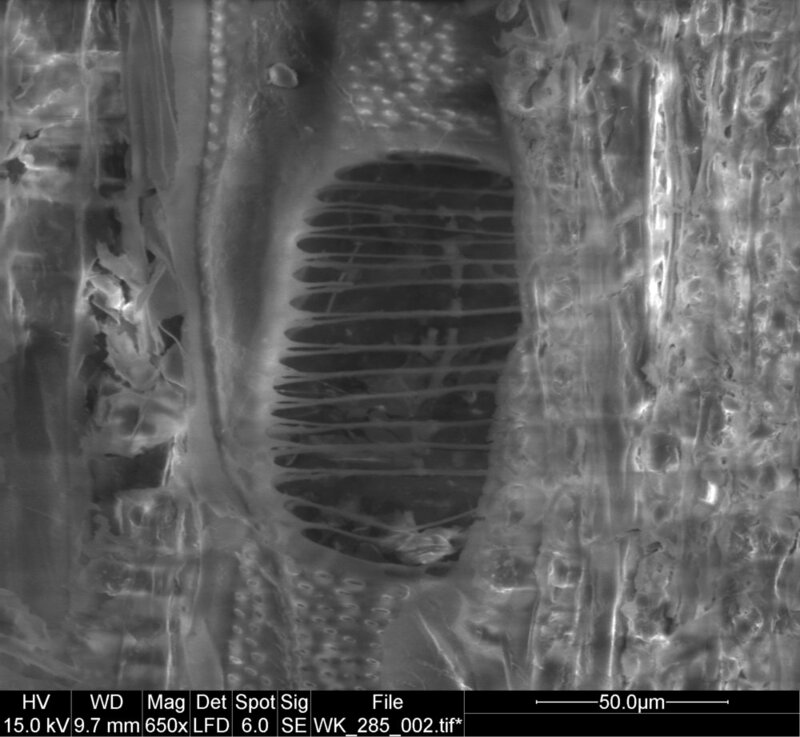 The scanning electron microscope allows us to resolve microscopic features in the wood that can help identify the particular species of tree that the spade was made from. 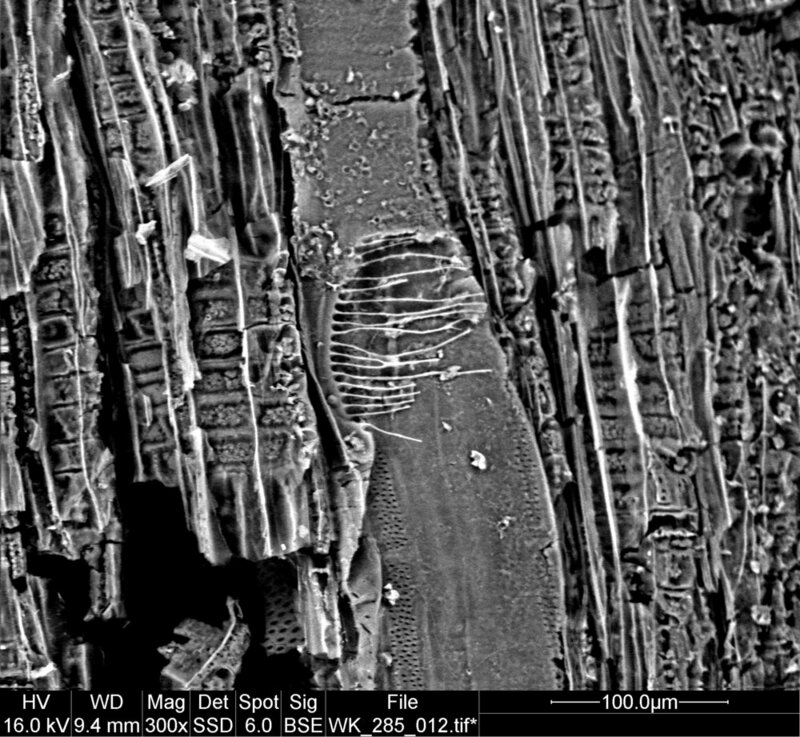 The series of features outlined in the SEM images above confirm that this object is made from Alder (Alnus glutinosa) wood. The sample of wood collected from trough 51.1935 was analysed using Fourier Transform Infrared Spectroscopy (FTIR). The spectral analysis above compares the sample from trough 51.1935 with a reference sample for European Birch wood (Betula pendula), and a reference sample for natural gypsum. While there are some minor variations in the intensity and position of some peaks in the spectra shown above, the sample from trough WK285 broadly corresponds with the reference sample for birch wood (included here as an generic example of a European hardwood). There is no evidence to suggest that the sample contains post-collection contaminants.